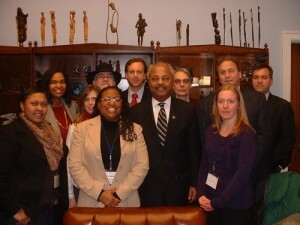 Here are my thoughts on the Good Jobs, Green Jobs conference I just attended in Washington, DC. (February 4-6, 2009 – GreenJobsConference.com). The good news is – the movement is hot and getting hotter; the bad news is, it’s running into plenty of opposition already, and even in its headiest moments it is up against some pretty challenging realities on the ground. Let me begin with the good news. This conference, which was put together by what only a few years ago would have been considered an unlikely coalition of labor and environmental groups, blew the doors off its original projection of 1500 participants and attracted more than 2500 people of all colors and convictions to discuss and to lobby not just for more jobs but more importantly for the right kinds of jobs – well-paying, protected jobs building a greener future. In terms of both movements, you could not get more mainstream players: on the one side, the Sierra Club and the NRDC; on the other, the United Steelworkers, the Teamsters, the AFL-CIO, the CWA, and others. That might seem like an unusual declaration for a union leader. But then, Hoffa went a step further in announcing that Teamsters was abandoning its push for oil drilling in the Arctic. Environmental activists and union bosses are known for their rancor. They have historically held opposite positions on key issues – drilling in fragile environments, nuclear power, logging ancient forests – pitting jobs against the environment. But that was before the values of the environmental movement were adopted by mainstream society, before union membership began to plunge and manufacturing jobs were exported overseas. Speakers at the conference included several US Senators and Governors; members of the new administration including EPA’s Lisa Jackson; UN Environment Program Executive Director Achim Steiner; Leo Gerard of the Steelworkers, James P. Hoffa of the Teamsters, and other labor leaders; Phil Angelides of the Apollo Alliance and other environmental leaders; and the truly inspiring figures of Winona LaDuke, Van Jones, and the Rev. Lennox Yearwood. More than 45 workshops, many filled to overflowing, discussed topics ranging from Prison Re-Entry and Green Jobs to Reinventing the American Auto Industry, with almost everything in between. I attended sessions on Workforce Training, Renewable Energy, and Investing in the New Energy Economy, as well as joining a number of other New Jersey participants in a round of “lobbying” visits to Senators and House members and their staffs as part of “Advocacy Day.” (In my group we spoke to Leonard Lance and Donald Payne, and to staffers for Rush Holt and Frank Pallone.) A Green Jobs Expo had 80 exhibitors, from government agencies to universities to professional organizations to private businesses. The most moving moments were with Van Jones and the staff of Green for All, both at a private reception on Thursday evening, and during an amazing speech on Friday morning in which he spoke of “being braver and going deeper,” to recognize that that this movement is not just for a clean energy economy but for restoring our very humanity and our connection the planet itself. Lennox Yerarwood pointed out that on top of the movement for equality and for justice, which continues, we now have a movement for our very survival and for an to “expendable” regions like New Orleans and Appalachia. Even as we met at the conference hotels and joined in making the case for a green recovery program for our cities, our country, and our world, the wrangling over what is already a flawed and insufficient stimulus bill continued on the Hill. The economic news continues to worsen, and the Republicans (and some “conservative” Democrats) continue to bring their tired and obstructionist arguments to muddy the waters and impede meaningful action. The issue is not just “stimulus,” for while it’s true that people who are losing their jobs, their homes, and their hopes for the future through no fault of their own desperately need relief, what’s really important is that we use this crisis as an opportunity to make a start on a new, more sustainable, and more just economy. Of course it’s bogus to say that a dollar spent on education or school nutrition “does not create jobs” the way a dollar spent on pouring concrete for roads does. While we do need to repair America’s “crumbling infrastructure,” there’s nothing green about concrete, and what we really need is more spending on mass transit and alternative solutions to a transportation system that is totally dependent on fossil fuels. And I could go on about issue after issue along these same lines. Tax cuts, even if targeted at the working poor (which of course they won’t be, if the conservatives get their way), do not distinguish between the right kind of spending and the wrong kind; etc., etc. But I don’t want to get on a soapbox about these issues, especially since I assume that I’m preaching to the choir. What’s missing, of course, is that the markets today are mostly driven by the wrong signals and incentives; and economists somehow can’t get it through their heads that there no markets on a dead planet. And if you think economists are bad, try Senators (who as one economist recently suggested, ought to include a few million extra in the stimulus package just to hire tutors who could bring them up to speed on today’s Econ 101 basics). And then there’s the corporate lobbyists who get paid to promote noxious falsehoods like “clean coal”… and the right-wing “think tanks,” who regularly trot out scholarly papers supporting transparently foregone conclusions. So what’s the upshot for our own conference (which is happening May 20-22, 2009 at Fairleigh Dickinson University – for more details see GreenVenturesConference.org)? I think it’s to recognize that we still have a very long way to go to make the case for a sustainable economy. As obvious as it may seem to us – that something unsustainable is, well, you know, unsustainable – it does not apparently seem obvious to many policymakers or many citizens. Things cannot, and indeed will not, continue the way they are. They could get worse, much worse. On the other hand they could, if we take concerted action, get better. It will not, in all likelihood, be a utopia. But it could be a helluva lot better than what we have now. We can build on a lot that is already good, and try to discard what isn’t working – for us and for the planet. I think if we leave people empowered to build a better world; enabled by having the most current, most accurate, and most complete information; and connected to each other by bonds that truly cannot be broken – we will have done our job. So this is my takeaway – along with a lot of specific ideas for sessions, speakers, exhibitors and sponsors, that I will be moving forward on.